We carry RG6 coax cable from Wilson Electronics and SolidRF, precut to various lengths and terminated with F‑male connectors for easy installation. RG6 is a popular choice for small-home cell signal booster kits because of its low cost, small diameter, ease of installation, and widespread use in cable TV and satellite systems. RG6 is compatible with 75‑ohm systems and components, including WilsonPro 75‑ohm commercial systems and weBoost Connect 4G and Home 4G residential systems. 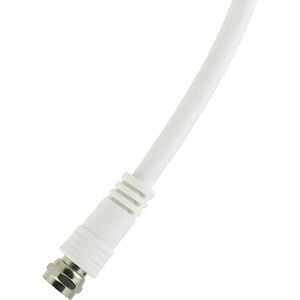 For longer runs of cable, we recommend using RG11 coax cable. RG11 has nearly half the signal loss per foot compared to RG6, making it the best choice for installations where the antenna is farther away from the booster unit. RG11, however, costs more per foot and is less flexible than RG6, and is therefore not as ideal for bending or running around corners.